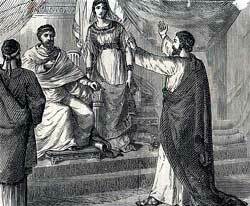 Paul is brought before King Agrippa, where he tells the King his story. FTER FELIX WENT to Rome a new governor was sent to take his place. This new governor was called Festus. Now, Festus was also a Roman as was Felix. He was unacquainted with the Jews and knew little about their customs, religion, and such things. He went to visit Jerusalem three days after he arrived in Caesarea; for there he could learn more about the people he had come to govern, as Jerusalem was the Jews' chief city. Several days later, after Festus had returned to Caesarea, he called for Paul, who had been in prison all this time, more than two years. And men who had come from Jerusalem stood up to speak false things against paul. But none of those things could they prove. The Jews still wished to have Paul taken to Jerusalem, hiding their reason. As Festus wished to please the Jewish people he said to Paul, "Are you willing to go up to Jerusalem and be judged there before me, concerning these things of which the Jews accuse you?" Paul replied, "Against the Jews I have done nothing to offend their law. If I have done anything worthy of death, I refuse not to die. I appeal to Caesar." Festus knew that every Roman citizen had a right to ask this privilege, of appearing before the great ruler of all the Roman Empire, Caesar, so he answered, "You have asked to be sent to Caesar, at Rome, and your request shall be granted." About this time some distinguished visitors came to Caesarea to see the new Governor. They were Agrippa, the governor of the country east of the Jordan River, and Bernice, his sister. This Agrippa was sometimes called a king. During their visit Festus told them about Paul. He told how the Jews had accused this prisoner of some offense concerning their religious law, which he could not understand. He said also that in his trial before the Jews, paul had spoken earnestly about one named Jesus, who he said had risen from the grave. On the next day Agrippa and Bernice entered the judgment-hall with Festus. Then Festus gave command and Paul was brought. Festus rose to introduce this prisoner to the King. He said, "Before you stands this man whom the multitude of Jews in Jerusalem have declared is not fit to live any longer. But when I found that he had done nothing deserving of death, and when he had expressed his wish to be taken before Caesar, in Rome, I determined to send him there to be judged. Now, however, I have no charge to make against him, therefore I have brought him before you people and especially before you, King Agrippa, that you may hear him and know for what purpose he is being held in bonds." Agrippa now spoke, and said to Paul, "You are permitted to tell your own story before us." Paul rose up, stretched out his hand on which hung the heavy chain, and said: "I am glad, O King, that I may speak for myself today before you, and tell why I am accused by the Jews. I know that you understand the customs and questions which are among the Jews, and you will understand my words. "From my youth the Jews know my life, for I was brought up in their city. And if they would, they could testify that I lived among the strictest of the Pharisees, keeping the law of Moses as carefully as any of them tried to do. And now I am accused by them because I believe the promise which God made to our fathers, concerning Jesus Christ, whom God raised from the dead. "The time was when I, too, thought I ought to persecute those who believe in Jesus of Nazareth. And this I did, shutting in prison many of the saints who lived in Jerusalem. I even received authority from the high priest to persecute the saints who lived in distant cities. I was on my way to Damascus to persecute the Christians there when I saw a vision from God. It was at midday, O King, when suddenly I saw on the road a light from heaven, more dazzling than the noonday sun, and the brightness of it frightened me and my companions. We fell to the ground, then a voice spoke to me in the Hebrew language, saying, 'Saul! Saul! why are you persecuting me?' I cried, 'Who are you, Lord?' and the voice replied, 'I am Jesus, whom you are persecuting.' That voice commanded me to stand on my feet while I received Jesus' orders. And that voice told me I should tell of Jesus, not only to the Jews, but to the Gentiles as well. "Because I have obeyed the command I received in that heavenly vision, O King, I am now being persecuted by the Jews who will not believe in Jesus. Again and again they have sought to kill me, but God has thus far delivered me from their plots, and he has given me strength to tell to all who come to me that Jesus is indeed the Christ of whom Moses and the prophets wrote." Festus beheld the earnestness of this chained speaker and he decided that Paul must be crazy. Not wishing to listen longer to his speech he could not understand, he cried out, "Paul, you are not in your right mind. Too much learning has made you crazy!" But Paul answered calmly, "I am not crazy, most noble Festus, but am speaking words of truth and soberness. King Agrippa knows these things of which I speak, therefore I talk freely to him." Then, turning to Agrippa, Paul said, "King Agrippa, do you believe the prophets? I know that you believe." Agrippa answered, "Almost you persuade me to be a Christian." Paul replied, "I would to God that not only you but all who hear me today were such as I am except for this chain." But the King was not ready to humble his proud heart and become a Christian. He rose up at once and went aside with Bernice and Festus and others to discuss Paul's case. He said to Festus, "This man has done nothing worthy of death or even of imprisonment. If he had not asked to be sent to Caesar he might be set free at once." But now it was to late to change the arrangement, and Festus could not set Paul at liberty.